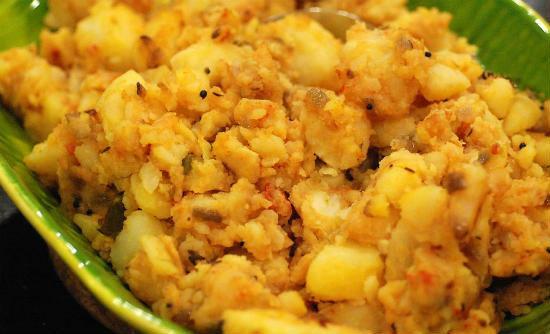 Potato Podimas is a popular and easy to make South Indian side dish made with mashed potatoes cooked in spices. 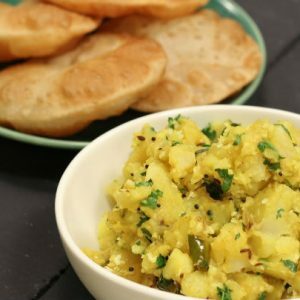 Best served with sambar or rasam with rice, they also make a great side dish to chapati. 1. Boil, peel and cut the potatoes in cubes. 3. Fry the mustard seeds, saunf and dals for 30 seconds. 4. Add the onions, curry leaves and garlic. 5. Saute until onions turn golden. 6. Add red chilli powder, turmeric powder and salt. 7. Stir well and add the potatoes. 8. Cook for 2 to 3 minutes or until the masala sticks to the potatoes. Add lemon juice if using and mix well. 9. Garnish with coriander leaves. Feel free to comment or share your thoughts on this Potato Podimas Recipe from Awesome Cuisine.